Okay, not the most uplifting way to start a post, I know. But it’s the reality we live with here on the hill. I’m pretty sure that whoever coined that phrase had to be a shepherd, because everyone knows that the thing sheep do best is DIE. Seriously, no exaggeration. Lambing season just brings the struggle into clear focus. For the most part, birth is a natural occurrence that happens with little or no human intervention. If the shepherd needs to step in, it is because the situation is critical, and the possibility of a positive outcome is neither guaranteed nor expected. Actually, the issue began earlier in the week when one of the old (old) ewes seemed to be going lame. Foot problems in cold, wet weather are not unusual, so I just made a mental note to keep an eye on it and went about my chores. Then, as I walked back into the barn the other evening, I found the skinny ewe wedged between the loading gate and the barn. (just how she got in this spot escapes me) At this point she was completely unable to walk because her back legs were particularly weak. I’ve seen this happen before when a ewe is hugely pregnant, and the lambs press on a nerve. Occasionally it corrects itself after the birth, but all too often it does not. Since there was torrential rain in the forecast, the Boss dragged her back in the barn and we settled her out of the way of the other animals. She seemed fairly comfortable and munched hay with a contented air. There was some tiny hope that she would recover, but it was much more likely that we were looking at a lost ewe. A downed animal develops other health issues rather rapidly as bodily functions depend on the animal being upright. But, there was a chance that her offspring could survive. As the days wore on, she required more and more interventive care. I brought her buckets of water. I tempted her to eat with alfalfa treats. I dosed her with nutrient drenches. To my amazement, she seemed to hold her own. When it became evident that birth was imminent, it was also obvious that human intervention was required. 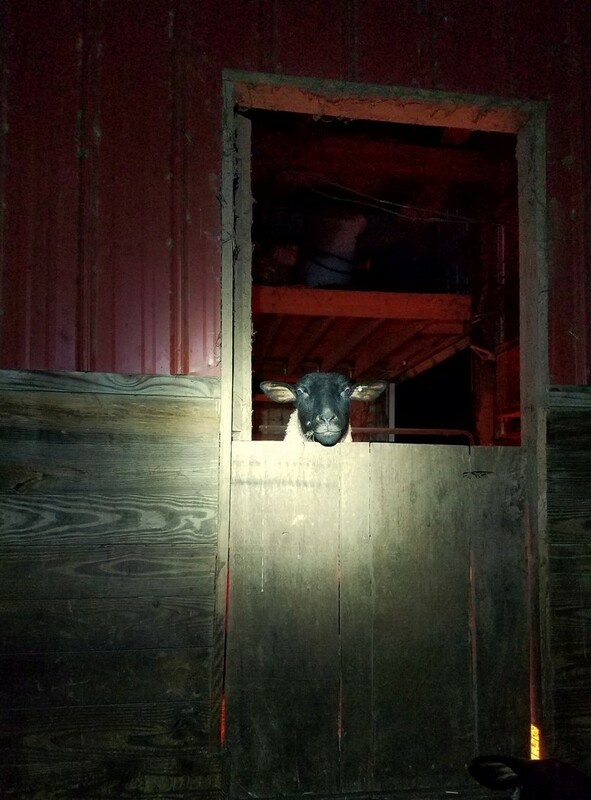 The ewe wasn’t even trying. 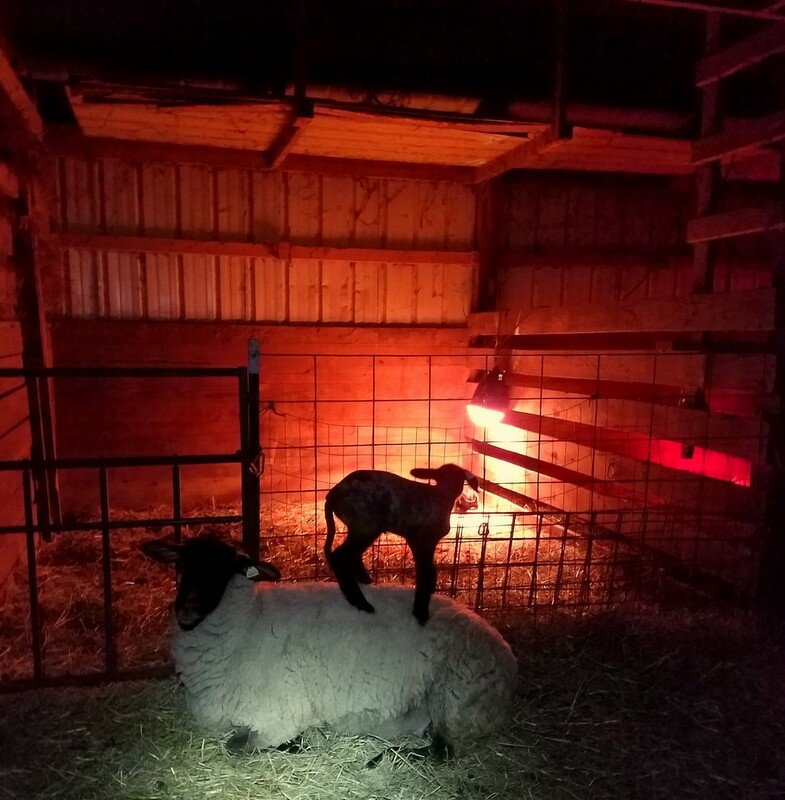 While the Boss and I were both pretty certain that this wasn’t going to end well, as the shepherds, we had to give it our best shot. She was totally lethargic and didn’t even struggle when I began my internal exam. None of this bode well for a successful lambing. There were two lambs inside that skinny old ewe. Two very big lambs that were all tangled together. And, there was no vigorous movement from those very big lambs. As a matter of fact, I couldn’t be sure there was any movement at all. This was not good. We strained and we struggled. We really tried. The fact that she couldn’t stand, or even shift her weight was increasing problematic. Usually in birth, gravity is a big part of getting the babies out. With the ewe stuck on the floor, brute strength was our only option. And, any “superpowers” I may have possessed are greatly diminished of late as arthritis seems to be gaining the upper hand. As the Boss drove the tractor out to dispose of the dead ewe and her lambs, I cleaned up the mess in the barn and headed back to the house. I spent the rest of the day trying not to think about the loss. Rather unsuccessfully, I might add. I hate that aspect of farm life. And, it never gets easier. But, it is the reality. And, while it certainly doesn’t make for an uplifting post, it gives you a sense of the lens through which we see the world. The hardships definitely make us more appreciative of the successes. We have learned to take nothing for granted. Ever. In other news, January has not brought with it the changes that I had hoped we would see in 2019. It is entirely possible that I am getting impatient and that things will change at some later point (that’s what the Boss says). But, for now, it seems we’re in a holding pattern. Did you see my snow day post? Click here. But, the lambs that we do have are healthy. The “lamb races” started this morning. (I may have to update this post https://homesteadhillfarm.blogspot.com/2013/02/espntake-notice.html )The pullets are beginning to lay eggs already. And, even though I didn’t make it to the annual Farmers’ Market meeting (lack of sleep and cold viruses make a miserable combination) there were a number of new folks interested in becoming vendors. That’s a good thing for the Market. And, in turn a good thing for the other vendors (including us). As we get ready to flip the calendar page to February, the cycle of life here on the hill will continue. After a little roadtrip, we have a fresh supply of potting mix, so we’re ready to start seedlings. The first batch of broilers will arrive in a couple of weeks, so we better get hustling on moving the pullets to the henhouse. And, since the hay supply is dwindling rapidly, we are guaranteed a good workout as we stack the barn full once more. Karma: "but, Sissie, Mama says to SHARE the cookies!" Karma and Gus have a "moment"
…and I hope you have a Happy Sunday! Thanks for stopping by. Please come “visit” again. I hope you have a good week as well. As usual, I admire your fortitude Barbara. As a farmer's wife - nolonger sadly as it is almost two years since he died - I know only too well that you have to take the rough with the smooth but animal deaths are never easy. Your photos are lovely - how I adore cardinals - and how beautiful your skies. I am so sorry for your loss, Pat! I truly admire how you've soldiered on since. We have a huge cardinal population and they seem to appreciate the feeder in the backyard. They seem especially beautiful in the gloomy days of winter. A poignant post. Thank you for sharing. Love all the photos of the babies, and especially that first photo with the silo. That first shot was taken up in Mennonite farm country just north of here when we went to get supplies a couple of weeks back. It's a beautiful part of the Valley. I feel your pain Barb! I have no lambs on the ground yet, but I have already had to call the vet for a yearling ewe with a bad vaginal and rectal prolapse. She survived almost a week - and I went out Sunday morning and she had died during the night - taking her lambs with her. ARGH! The rest look OK - but I take nothing for granted. You just never know with the weather and animals!! I just take one day at a time! I hope your year turns around and goes get better than last year! God Bless! Sorry about the ewe. That is a bummer. We're taking it as it comes. Like you said, you just never know and you can't take anything for granted. Oh my Barbara - I am attributing my sheep issues to the long and unforgiving winter. I had to call the vet for a ewe that had a vaginal prolapse - no lambs even on the ground and had to pay the vet. Well - we still lost her and her lambs! And even with 42 almost healthy lambs on the ground - I still lost 8 others - some born dead and some just died. I have a few tiny lambs - even from my bigger and healthier ewes. So, I am just going to write this year off and see what next year brings. Nothing I can do now but take care of the ones I have. God Bless! !